.. a light will shine through that window, a beam of light will come down upon you, you will experience an epiphany … and you will suddenly realize that you must go to the polls and vote for Obama” – Barack Obama, Lebanon, New Hampshire. 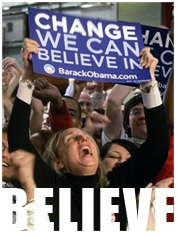 Lots more disturbing stuff at Is Obama the Messiah? I’m pretty sure it is a parody site. Women faint around him, and his message of hope and change are moving the mountains of Clinton inevitability. Now his wife tells us that he is the only one that can “fix American souls”. When Mike Huckabee made the statement that the Constitution should be amended to reflect the word of God, the media made sure to cover the “threat of theocracy”. Much was made of Mitt Romney’s Mormon faith as well. However, when overt and audacious statements like this one are made…its a different picture. IT’S TELLING THAT we’ve heard so much about the religious faith of Mike Huckabee and Mitt Romney, and so little about the faith and religion of Hillary Clinton and Barack Obama. Huckabee’s Southern Baptist commitment and belonging have been made much of, as was former candidate Romney’s Mormon faith. Article upon article, news show and radio broadcast have debated and dissected the faith of these two Republicans. How many articles or op-eds do you remember exploring Clinton’s Methodism or Obama’s active participation in the United Church of Christ? I can only remember one, on Obama, and I wrote it. When it comes to religion, the media and the conversation that dominate the public square operate from a script that prefers to see all religion as conservative, right wing and slightly retrograde. Perhaps this script is why we the media are taking little notice to statements like the one Michelle Obama made, and we are once again left with the blogs to put things into perspective. But it’s the notion that only Barack Obama can save our souls that is the most offensive part of the speech, by far. Government doesn’t exist to save souls; it exists to ensure domestic tranquility and provide for the common defense. If I feel my soul needs saving, the very last place I’d look (in the US) for a savior would be Washington DC or Capitol Hill. I’ll trust God and Jesus Christ with my soul, and I’m not going to mistake Barack Obama for either one. Indeed, Huckabee and Romney both got their fair share of criticism and mockery over their religious backgrounds, and neither were anywhere near this kind of overtness. About the closest thing was when Huckabee mentioned changing the Constitution to come in line with the word of God, which even I criticized. However, no other candidate has tried to claim the power to fix souls. I know that the other side will argue that this rhetoric was meant symbolically and not literally. However, our souls are the most personal things individuals have, and government shouldn’t even be attempting to enter that area symbolically. Further more the media should approach this with the same scrutiny they would for a Republican. I wonder how the ninnies who squeal about “Christianists” and the “American Taliban” will twist their brains to justify this outright call for a statist Theocracy. Its important to clarify that while we mention theocracy, that isn’t the biggest qualm. It has to do with the audacity of a statement claiming such ridiculous and offensive religious overtones that are complete falsehoods, or as Bill Clinton would say, “fairy tales.” It is also important to disqualify the excuse that was his wife, and not him that said this. Sister Toldjah does a good job on this. Indeed, lets keep government out of the arena of souls…please. Expect the media to completely ignore this. Regardless of what intentions the media interpret behind the statement they should be treating it as a gaffe that requires clarification. They won’t. –John Stephenson is editor of Stop The ACLU.